What are Campbell's Russian Dwarf Hamsters? Commonly known as Campbell's Russian Dwarf Hamsters or Campbell's Dwarf Hamsters (Phodopus campbelli) is a species of dwarf hamster. This species was discovered by W.C. Campbell in 1902 in Tuva, an area that has historically been geographically linked with both China and Russia. The Campbell's Russian Dwarf Hamster is also native to the steppes and semi-arid areas of Central Asia, the Altay mountains, and the provinces of Heilungkiang and Hebei in Northeastern China. This species of hamster is sometimes called Djungarian (or Dzungarian), or simply Russian, and often it is mistakenly labeled as a Siberian or Winter White Russian dwarf hamster, a closely-related species of dwarf hamster. (See how to tell the difference between species of dwarf hamsters.) In Tuva the species is called Pouched in the Tuvan language, referring to the well-known physical characteristic of most hamsters. There has been some debate over the classification of Campbell's Dwarf and its closely related cousin, the Winter White, but now the two species are usually classified as Phodopus campbelli and P. sungorus, respectively. 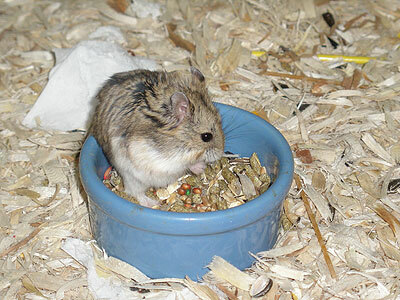 Campbell's Russian Dwarf Hamsters are claimed to be less friendly in temperament towards humans than the winter white and may have the tendency to bite or nip. Click on any of the pictures throughout the site to zoom in for a close-up.